Capital of county with same name, Klaipėda is third largest Lithuanian city located at the opening of Nemunas River. Known for its rich history, Klaipėda is also one of the major ice-free ports. This multipurpose deep water port city is a key Lithuania transportation hub and home to major ship-repair, ship building yards and other marine business. 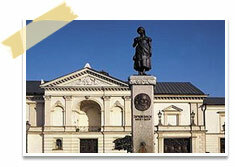 Being a city with historical importance to it, Klaipėda's main attractions are it architectural rich historic buildings. Most of these buildings date between 13th to 18th centuries. Klaipėda Castle is a 13th century landmark which was captured and occupied by Russians in 1756. Maritime museum in fort Wilgelm was built in 19th century. Other such important historic attraction is 10th century Žardė ancient settlement. Those who enjoyed exploring local museums can visit Pilies muziejus, Kalvystės muziejus and Mažosios Lietuvos istorijos muziejus. Klaipėda also has lively clubs and stunning beaches to offer to holiday travelers in Lithuanian. Being connected with around 31 neighborhoods, travelers in Klaipėda can make use of car rental service to explore other regions like Smeltė, Baltijos and more. Powered by trusted car rental broker firm and major suppliers in Lithuania, Lithuania Cars Rental is known for presenting its customers with best deals at lowest prices. With an aim of making car rental easy and accessible, Lithuania Cars Rental provides you with easy to book interface where all you have to do is search for your favorite location, car type and book on your preferred date/time. At Lithuania Cars Rental, you can also manage and make changes in your booking online. Book a car from Lithuania Cars Rental to commute in Klaipėda. A car rental means you also get access to Klaipėda’s neighborhood.